Is having a pool an absolute necessity? We understand and many of our properties offer many different shapes and sizes of pools. Some are even heated during the winter months. 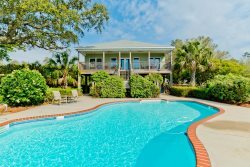 Make your trip to Gulf Shores, Alabama a little more comfortable and check out our vacation homes with pools today! Looking for a beach house rental with a private pool? Some of our Gulf Shores beach homes have their own private pool for your exclusive use! Browse and book online, or contact our office to find the exact rental for you!